Ca'Pietra Tiles. 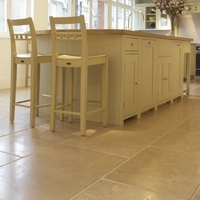 Hamlet Limestone Floor tile collection. The distressed finish is created by hand-fettering and then softly rounding the edges of the stone. With the interesting fossil markings of Hamlet limestone, this creates a subtle, characterful surface that creates a natural link between period and contemporary features. If you want to create a seamless look use these slabs both inside and out. The etching, which increases the non-slip properties of the stone, also gives it a more neutral colour. When used inside we recommend waxing the stone to reduce the slight harshness which is necessary for outdoor use. This is a really robust, great value stone. This is a really robust stone with warm autumnal tones and interesting fossil character - another great value stone from Ca'Pietra.